Since June 2017, the Department has been tirelessly working with its IT consultants, GCR Incorporated, to making it easier for Louisiana residents and other users, to locate and view health, environmental, exposure and population data. LDH’s Health Data Portal 2.0 most recently includes birth defects and updated cancer and birth outcomes data as well as new features including a searchable glossary, zoomable maps and “pop-out” display windows which expand and provide simultaneous data view. Although statewide data was not available from 2009 to 2012 due to a staffing shortage in several LDH Administrative Regions, the Louisiana Birth Defects Monitoring Network has collected statewide surveillance data for 2008, 2013 and 2014. Statewide birth defects data is now available for the first time on the data portal. The birth defects and other data that is published on the portal can be queried by parish and displayed in maps, tables and bar or line charts. It can also be viewed in linked windows side-by-side for comparison. Selections can be exported as images or in tables for individual use. Five additional years of Centers for Disease Control and Prevention (CDC) funding has made it possible for the Department to host additional statewide health, environmental and population data, and to continue to add and update its website and data portal. 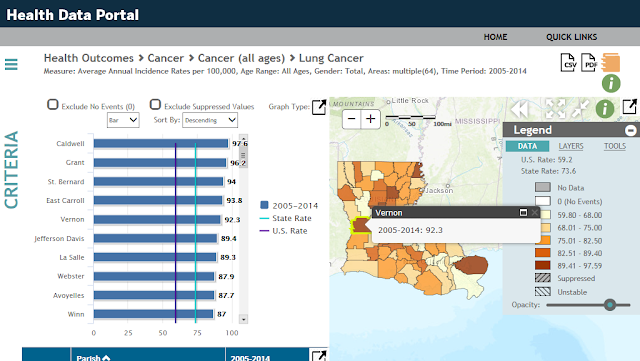 Louisiana is one of 25 states and New York City to be awarded funding from the CDC’s Tracking Program to provide city and state officials, residents, public health practitioners and others with better health data. Ultimately, the data could be used to “identify communities at risk, inform health policies, educate residents, inform state and city planning and develop targeted prevention activities“(CDC, 2017). The state’s Tracking Program is housed in the Section of Environmental Epidemiology and Toxicology (SEET). A growing list of health agency and external partners have contributed to the success of the program by sharing their information and data and providing SEET with technical assistance to ensure that the web content and data are comprehensive and accurate. Additional data and new portal enhancements are planned for 2018 and beyond! 0 Response to "New Year, New Data! LDH Upgrades Its Online Data Exploration Tool to Provide Residents with Better Health Information"